Why sustaining growth is a personal business. With all this talk of recession threatening to get us down, it’s time to focus on practical value-for-money ideas that get results. Our cover story explores an initiative that makes economic sense – but most importantly offers inspiration and social interaction alongside therapy. Participants found that getting involved with the project opened doors to something more meaningful for them, and I was struck by the sheer sense of involvement and ownership the initiative inspired – surely signs of progress where recovery is concerned. American guru Bill White makes the point (at his seminar, reported on page 14) that successful movements are not built on anger and victimhood, but on empowerment and organisation – to which ethos the gardening project adds a good deal of energy. Having the commitment to become self-sufficient is massively important – the other part of the equation is knowing the practical resources to live life away from substance dependency are within reach. Sara McGrail (page 9) talks of the impact of recession, pointing out that to ignore the link between economic situation and substance misuse is to be deliberately blinkered. 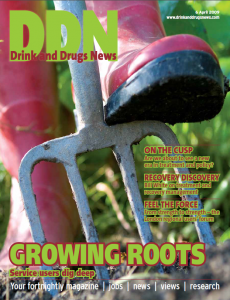 We are always trying to focus on practical support in DDN, looking at ways to prevent people from going back to drug or alcohol use by default. Keeping one step ahead of recession is a necessary part of this – can we afford to ‘save’ now on vital support services for people in danger of losing homes, jobs and means of income, if it means picking up a massive treatment bill much later down the line? Be actively interested now, Sara urges, and I would echo the need for service providers and users to get together with all parties that can make a difference, from government, banking, welfare services, community groups – our field’s own G20? – to debate practical ways to avoid disaster on a very personal scale.